0:02:10 Leonard Cohen: Hallelujah. It is originally released on Cohen’s 1984 album Various Positions. Following its increased popularity after being featured in the film Shrek (2001), many other arrangements have been performed by many and various singers, both in recordings and in concert, with over 300 versions known. 0:07:47 Gioachino Rossini: “Domine Deus” from Petite messe solennelle (Little solemn mass). Written in 1863, Petite messe solennelle (Little solemn mass) was a very late work of Rossini. The composer had retired from composing operas more than 30 years before. The third movement of the Gloria is a tenor aria, setting “Domine Deus rex celestis” (Lord God, King of Heaven). 0:12:49 Charles Gounod: “Sanctus” from St. Cecilia Mass. The work was composed in 1855 and scored for three soloists, mixed choir, orchestra, and organ. 0:18:55 Michał Lorenc: The Most Beautiful Ave Maria I’ve Ever Heard. Michał Lorenc (born 5 October 1955 in Warsaw) is a Polish film score composer, best known for his work on Bandyta, a 1997 Polish-German-French drama film directed by Maciej Dejczer. 0:22:23 Johannes Brahms: “Wiegenlied: Guten Abend, gute Nacht” (“Good evening, good night”). Widely known as “Brahms’ Lullaby”, was published in 1868. The lyrics of the first verse are from a collection of German folk poems called Des Knaben Wunderhorn and the second stanza was written by Georg Scherer (de) (1824-1909) in 1849. The lullaby’s melody is one of the most famous and recognizable in the world, used by countless parents to sing their babies to sleep. 0:24:42 Johann Sebastian Bach: “Jauchzet, frohlocket” from Weihnachts-Oratorium (Christmas Oratorio), BWV 248. The oratorio was written for the Christmas season of 1734. 0:28:59 Georges Bizet: “Au fond du temple saint” (“At the back of the holy temple”) from Les pêcheurs de perles (The Pearl Fishers). A famous duet from “The Pearl Fishers”, an opera in three acts (composed in 1863). One of the best-known numbers in Western opera, it is sung by Nadir (tenor) and Zurga (baritone) in act 1. 0:38:39 Ernesto Lecuona: Malagueña. It is a song by Cuban composer Ernesto Lecuona, written in 1928. Malagueña was originally the sixth movement of Lecuona’s Suite Andalucia. 0:43:09 Traditional Spiritual: I Want Jesus to Walk With Me. 0:47:10 Hristo Nedyalkov (1932 – 2013): Simna Pesnitschka. 0:50:56 O Heiland, reiß die Himmel auf (O Saviour, tear open the heavens). It is a Christian Advent song. The text was first printed in 1622 and was attributed to Friedrich Spee; the melody appeared in print first in 1666. 0:52:28 Es ist ein Ros entsprungen (“A rose has sprung up”). It is a Christmas carol and Marian Hymn of German origin. It is most commonly translated in English as Lo, How a Rose E’er Blooming, and sometimes as A Spotless Rose. The rose in the text is a symbolic reference to the Virgin Mary, and the hymn makes reference to the Old Testament prophecies of Isaiah which in Christian interpretation foretell the Incarnation of Christ, and to the Tree of Jesse, a traditional symbol of the lineage of Jesus. 0:54:04 Fröhliche Weihnacht überall (Marry Christmas everywhere). It is a German-language Christmas carol. The song is rumored to come from England from the 19th century. An English original text is not known. The German text is occasionally attributed to the German poet August Heinrich Hoffmann von Fallersleben (2 April 1798 – 19 January 1874). In the works of Hoffmann, however, the poem is not demonstrable. 0:56:02 Joseph Haydn: Trumpet Concerto, 3rd movement – Allegro (rondo). Trumpet Concerto in E flat major was written in 1796 for his long-time friend Anton Weidinger. Haydn was 64 years of age. A favorite of the trumpet repertoire, it has been cited as “possibly Haydn’s most popular concerto”. Soloist: Melissa Venema, the Dutch trumpeter. 1:01:41 John Jacob Niles: I Wonder as I Wander. It is a Christian folk hymn, typically performed as a Christmas carol, written by American folklorist and singer John Jacob Niles. 1:05:15 José Barros: Navidad Negra. 1:08:14 Corramos Corramos. It is a traditional Venezuelan Christmas carol. 1:10:06 Eduard Ebel: Leise rieselt der Schnee (The Snow Falls Quietly). It is one of the most famous winter songs in German. It was written by the Protestant pastor Eduard Ebel (1839-1905) in 1895. 1:12:27 Traditional: Heißa Buama. It is a traditional Austrian Christmas carol. 1:15:03 José Feliciano: Feliz Navidad. It is a macaronic Christmas song written in 1970 by the Puerto Rican singer and songwriter José Feliciano. With its simple Spanish chorus (the traditional Christmas/New Year greeting, “Feliz Navidad, próspero año y felicidad” meaning “Merry Christmas, a prosperous year and happiness”) and equally simple English verse “I wanna wish you a Merry Christmas from the bottom of my heart”, it has become a classic Christmas pop song in the United States, throughout the Spanish-speaking world and internationally. 1:18:42 George Frideric Handel: “Hallelujah” from Messiah. 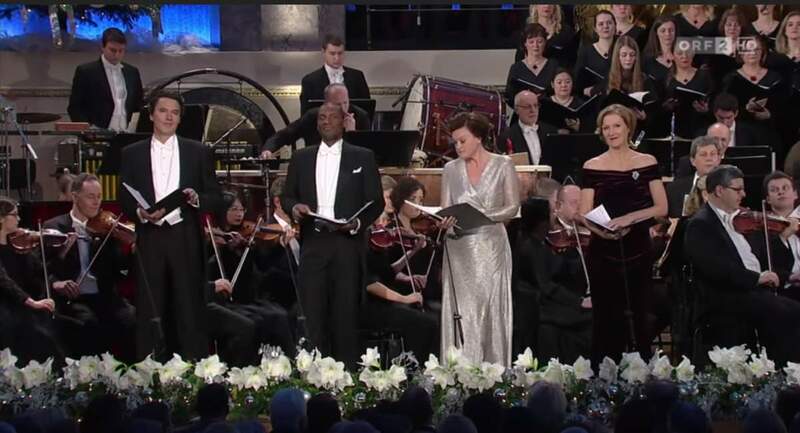 Messiah is an English-language oratorio composed in 1741 by George Frideric Handel, with a scriptural text compiled by Charles Jennens from the King James Bible, and from the version of the Psalms included with the Book of Common Prayer. It was first performed in Dublin on 13 April 1742 and received its London premiere nearly a year later. 1:25:35 Franz Xaver Gruber: Stille Nacht, heilige Nacht (Silent Night). is a popular Christmas carol, composed in 1818 by Franz Xaver Gruber to lyrics by Joseph Mohr in the small town of Oberndorf bei Salzburg, Austria. It was declared an intangible cultural heritage by UNESCO in 2011. But if I did-well, really-what’s it to you? schau im Traum ‘s Paradies. Let us with voices united adore Him. Ô vision ! ô rêve! Plus charmante et plus belle! Et la foule est à genoux! Oui, c’est elle ! C’est la déesse! Soyons unis jusqu’à la mort! Who the world will adore. Darauf sie all’ ihr’ Hoffnung stellt ? [Von] Elend zu dem Vaterland. The king over Jacob’s house. From misery to the Father’s land. Because you lead the ones who trust you into a blissful peace. That everyone must admit, the Christ child came for me. Macht die Herzen so warm. Strahle, du Stern überm Wald! Christmas shines over the woods. Rejoice, Christ child comes soon! Rejoice, Christ Child is coming soon!